Get the kids in the kitchen to whip up this afterschool snack. 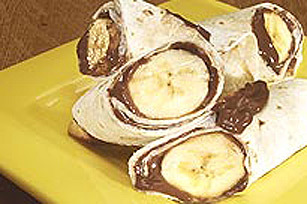 Bananas and chocolate pudding get rolled up with tortillas for a simply sweet treat that's ready in 10 minutes. SPREAD 2 medium flour tortilla with a Jell-O Non-Refrigerated Chocolate Splat Pudding Snack. PLACE a banana in each of the centre of the tortilla; roll up. Spread Kraft Smooth Peanut Butter onto tortilla before adding pudding and banana.